In Silicon Valley, approximately one-fifth of the population is 65 and older. This figure will jump to one-infour by the year 2030. While we have all heard about the demographic “age wave,” what is less known is that half of adults 60 and older in Santa Clara County (50%) live below the Elder Economic Standard Index (EESI), an area-specific measure of poverty, according to the latest report from Council on Aging. Local senior service agencies are coming up with creative solutions to engage the community in helping their neighbors. For the past two years, The Health Trust partnered with Council on Aging to engage 90 volunteers and 270 agencies to inform 28,000 adults 50+ of local resources and keys to healthy aging. Resources highlighted included free and income-based local programs for health, fall prevention, housing, transportation, in-home support, caregiver support and food and meal programs. 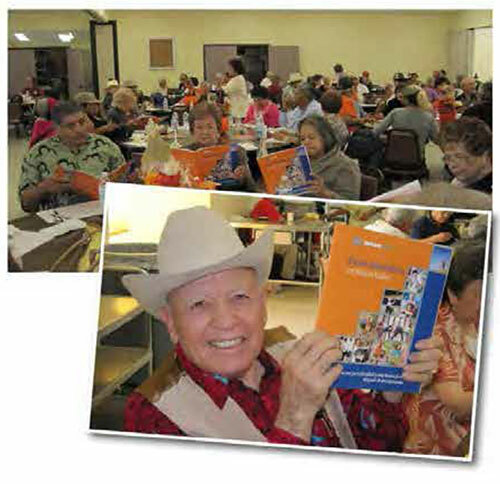 Volunteer ‘Health Champions’ connected with faith communities, libraries, health clinics, senior lunch programs, ethnic sites, after-school programs, hospitals, the Veterans Administration, and more. Silicon Valley is one of the wealthiest areas in the nation, but at least one-half of our seniors have a myriad of unmet needs. ‘Healthy Steps’ is one of many volunteer opportunities to help ensure that older adults spend more years in good health and engaged as vital members of our community. How can you help to make this a place where we can all age with dignity and health?